It is quite important to learn about the different nursing programs and comprehend the degrees that may suit your preference. Today, various programs and affordable education options have been made available to nursing students. However, before making a career choice, you will need to make a decision on the programs that shall auger well with your career goals, existing lifestyle and time frame. The right education decision will guarantee success in your nursing career. The following are the nursing degrees. Licensed Vocational Nursing (LVN) or Licensed Practical Nursing (LPN) programs will take you a year to complete. In most instances, LVN/LPN programs suit students that are working or have other obligations. This is because you can be trained from a nearby hospital, community college or a vocational training institution. It ‘s nice to know that specific courses can be done through the online platform as busy students can study based on their demanding schedules. The program is fast-paced because it prepares students for their initial nursing job through teaching them basic skills. Completion of LPN/LVN program and a passing of a nursing examination, NCLEX-PN, which is administered by the state, makes you eligible for licensures. Prospective students already working as Certified Nursing Assistant can progress into the profession through one of many CNA to LPN programs. Students interested in being entry-level RN should pursue the LPN-to-Associate’s (ADN) bridge programs. You shall be necessitated to pursue some courses in liberal arts to add time and complexity to this program. With hybrid online programs being offered in different schools, you can be able to complete some of the programs at your pace. There will be the need to have a working schedule that allows for clinical practice at a medical facility within the locality. With an ADN, you are a step closer to pursuing a bachelor’s degree if you continue with school. Tuition reimbursement by some employers is provided particularly for licensed practical nurses having interest of becoming an RN. An associate degree in nursing (ADN) program largely zeroes in on technical skills and less on theory. Around 30% of ASN graduates use the ADN program as a stepping-stone to pursuing a BSN. This option is quite good for individuals that have not worked as LVN/LPN, but would like to start their careers as RNs. Most ADN programs are offered through vocational schools or community colleges. It takes around two years to complete, given the flexibility of the program regarding weekend and night courses. This course is perfect for students having families and job obligations. This bridge program takes into account the LPN work experience. This means that you will not be required to complete the traditional 4-year BSN route. However, you will be provided with a liberal arts education. Once you have completed the program, you shall be qualified to work as an RN. Students can attend part-time classes. However, a full-time student can complete the program in four academic semesters. Given that this program is more rigorous compared to other LPN programs, it is crucial for students working while attending classes to watch their workloads. Earning a BSN can be an entitlement to managing other nurses. 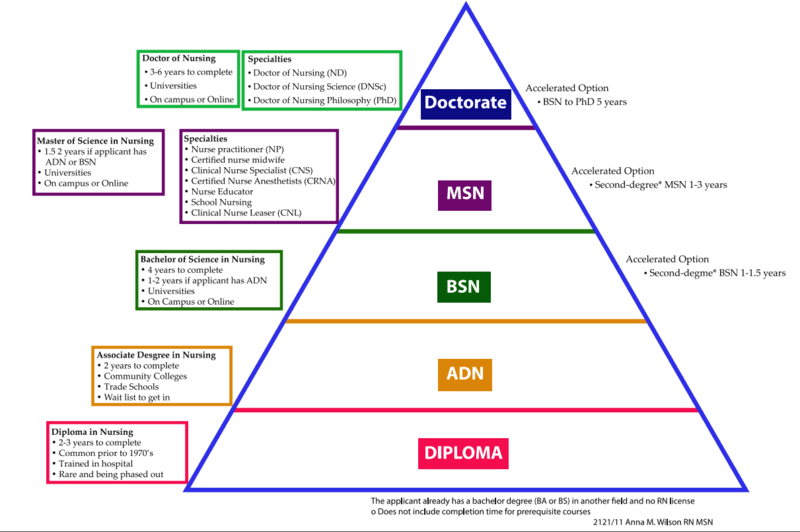 An RN having a bachelor’s degree is perceived to be more senior compared to one having an ADN. Such an individual also has a higher salary. If you have plans to earn a higher degree in the foreseen future, it is recommended that you get a BSN. If you have some questions regarding LPN-to-BSN, continue checking out this wide-ranging guide. Most nursing leaders prefer a BSN degree. In today’s competitive job market, this degree provides one with the best opportunities. A four-year BSN program requires commitment and dedication. Some students can work while still pursuing their degrees. However, there is the need for you to devote more time to lab time and coursework. To this end, you need to consider on how to manage your schedule in an efficient manner. Some BSNs can be studied through a hybrid program. You can study for the hybrid program through online classes. Practical lessons are usually scheduled on campus or at a hospital within your locale. If you look at different job postings, you will find that many positions require the incumbent to have a BSN degree. This level is regarded as the entry point for anyone wishing to be a professional nurse. If you have plans of pursuing a higher degree in the future, earning a BSN out of the gate is the best option since it is considered a prerequisite for master’s program. This bridge program has been designed to cater for the educational needs of registered nurses that have graduated with an associate degree or diploma programs but would like to pursue their BSN degree. By taking the bridge program, RNs can save money and time that would otherwise have been expended on an entire BSN program right from the start. The RN-to-BSN program recognizes the credits for nursing skills that you have already learned through work experience or school. You can complete the program in about two years. This program has a flexible schedule that has been designed to address the needs of working nurses. Instead of the program beginning in September, the schools offering the program have multiple start dates all year. Students can pursue online RN-to-BSN programs as they are available. Successful completion of an RN-to-BSN program can elevate you to supervisory positions thus higher earnings. This program is also crucial if you have plans of earning a master’s degree in the future. This program is specifically designed for non-nurses having bachelor’s degree in fields that are not affiliated to nursing. Second degree BSN will avail credits for completing your liberal arts requirements. Since the liberal arts credits earned from other bachelor’s degree that you have done taken into account, a Second Degree BSN can take two academic years or less to complete. Students that need more scheduling flexibility can enroll for online classes but it is proper to note that the courses are more challenging. Crucial to note is that clinical rotations are undertaken in your locality, so there is the need to plan your schedule and attend. A variation of the Second Degree BSN, which is known as the Accelerated BSN, can take you between 12 to 20 months to complete. Once you have graduated, you shall be entitled to take the national licensure exam like the other BSN programs. Having a BSN qualifies you to work as an RN with a high propensity to be elevated to supervisory positions. BSN can enable you to pursue a higher degree. This masters program allows nurses to specialize in a specified area such as research or advanced clinical training. Some students have been undertaking a joint degree in related fields such as hospital administration, business administration, and public health. Traditional MSN programs take lesser time to complete compared a BSN. It takes between 18 and 24 months to complete. However, the MSN programs are rigorous as they deal with advanced specialty. Students have to narrow their focus. A thesis or project is required at the end of the program. Working nurses have the option of using the online programs or having their employees reimburse their tuition. A joint degree, MSN/MBA program, suits working nurses, but the course is demanding. Completion of MSN can move you higher in the nursing career ladder. You will learn progressive skills, from nurse practitioner to nurse midwifery that will allow you to provide care to patients more like a doctor. Nurses having MSNs are likely to enjoy higher monetary benefits and salaries. RNs having an associate’s degree can enroll in an RN-to-MSN program that can allow them to earn a BSN and MSN. Direct entry MSN programs are commonly referred as graduate entry or master’s entry programs. These programs are suitable for non-nurses holding bachelor’s degree in other fields. Entry-level RN can pursue the bridge program and be able to specialize in one area of advanced nursing. Credit earned for the BSN programs is recorded given that courses are geared towards the specific needs of students. Online RN-to-MSN courses are available with some starting severally in a year. The degree programs take into account about RN licensure and advanced training in a specialty area for the master’s programs. Three years are required for the direct entry MSN program to be completed. The first year is spent on entry-level coursework while the last two years are devoted to masters level study. In the next ten years, nurses having a doctoral degree will be in high demand. These programs focus on advanced clinical practice, clinical research and health administration, which is preferred for nursing executives. Students have to be committed to their studies as they take between 4 to 6 years to complete. A Doctorate of Nursing Education program seeks to develop practicing and specialist skills of the nurses. This is a newer degree that emphasizes more on clinical practice and leadership development. Most ND programs take between 3 to 5 years of full-time study to complete, inclusive of summers. Completion of the DNP program requires three years of full-time study. The DNP program is suitable for working nurses. ND programs prepare you to draw evidence-based decisions in educational, clinical and organizational settings. DNP programs will provide you with the necessary skills to undertake research, understand patient outcomes, management of systems and clinical care. Even though time is of the essence, your decision should be focused on matching your career goals with the appropriate degree. DNSc program graduates are nurse scientists. They have adequate investigative skills as well as clinical and leadership capabilities that can have an impact on the health care system. If you attend full-time classes, you will complete the program in five years time. Part-time classes are available though you will take longer to complete classes. The program entails a challenging coursework, clinical defense, thorough research and a final dissertation. As a graduate of DNSc program, you shall be eligible to work as an administrator, analyst or educator among other high-ranking positions. One can make an impact in the nursing field by earning a DNSc. Nurse scholars are researchers who can advance theoretical foundation of health care delivery and nursing practice through Ph.D. programs. Most Ph.D. programs will take you between four and five years to complete if you attend classes as a full-time student. Part-time classes are available. Ph.D. students have to engage in extensive research and prepare a final dissertation, but they are not necessitated to complete the clinical hours. Most Ph.D. students earn scholarships and grants, which they use to pay for their fees. Upon graduation, you will be qualified to pursue different dimensions of scholarly and professional life. A Ph.D. graduate can conduct an academic inquiry, form public policy and provide leadership in health care delivery systems. Highly qualified nurses having a bachelor’s degree in nursing and are interested in pursuing an intensive and accelerated program can pursue the MSN/Ph.D. dual degree. The program offers master’s preparation while at the doctoral level; it provides one with advanced training in research. It takes five years to complete. Some schools are offering the program to students having a non-nursing bachelor’s degree.